Long Compton is a village near the extreme southern tip of Warwickshire and close to the border with Oxfordshire and it can trace itself back to Saxon times. In medieval times, Long Compton had a market and a fair and St. Augustine is said to have preached there in the 15th century. As the name implies it is a long village and stretches out along the A3400 (Oxford to Stratford upon Avon road). The village lies within a Conservation Area as well as the Cotswolds Area of Outstanding Natural Beauty. A lot of the dwellings in the village are of typical Cotswold stone and the older ones have thatched or stone tiled roofs. The most photographed buildings in the village are the Grade 1 Listed parish Church of St. Peter and St. Paul, which dates back from the 13th century and the iconic two storey half-timbered lych-gate. Some of the older residents can remember the old thatched cottage on the second storey as the home of the village cobbler, but it is now houses the History Society Archive. Inside the south porch is a well worn 14th century effigy of a recumbent figure, with much speculation but little fact as to its origin. Once inside the church, the fine Gothic proportions reflect the importance of the wool trade in the area that funded the building and the alterations in earlier centuries. There is an obelisk war memorial in the churchyard of St. Peter and St. Paul Church. Several craft and trade buildings, such as Mill, Gaol, Smithy, Wheelwright, Malt House, Meeting Houses and properties belonging to the Church can still be identified around the village; by their names. 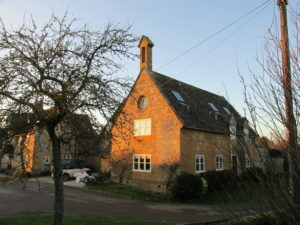 There are two other chapel buildings in Long Compton. The Methodist Chapel in Butlers Road is still a place of worship and was consecrated in 1807 and is stone built with a tiled roof. The second building is the former Wesleyan Chapel in East Street and is now a private residence. Other notable buildings in Long Compton are the 17th century Vicarage, almost opposite the church, The Manor House along the Main Street which is now a hotel and a number of ancient water fountains that can be found around the village. 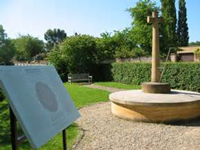 In the area of the Village Store there are the remains of a medieval cross and The Millennium Garden. This garden was created to celebrate the arrival of the new millennium. It shows a chronology of the important events over the 2000 years and is planted with snowdrops in memory of those from the village who died in the First World War. The Acorns combined infant and junior school is in School Close. Long Compton has a purpose built Village Hall on the Main Street. The Red Lion, which was originally built in 1748 as a coaching inn on the main Oxford Road is a Grade 2 Listed Building and still retains the charm and character of a Cotswold country pub. The interior also retains the old world atmosphere with oak beams, log fires and gleaming wood. The village of Long Compton has always been associated with witchcraft and legend has it that it was the home to numerous witches. The tales stemmed from superstitions surrounding the nearby Rollright Stones, an ancient stone circle situated one mile away from the village. To this day the southern end of Long Compton is known as the ‘witch end’ of the village, because of the number of them that was rumoured to live there. Barton on the Heath is one of Warwickshire’s most sleepy and idyllic villages and is at a point where four counties meet. The mellow stone houses and cottages and the views across the Vale of Moreton make it a very pleasing place indeed. Barton on the Heath has a rich history and connections with Robert Dover, who started the Cotswold Games. He is buried there as is the mother of William Wilberforce. The village is dominated by the Parish Church of St. Lawrence and by the imposing Barton House. The parish Church of St. Lawrence was built by the Norman masons in the early 12th century and the saddleback tower was added a century later. In the 14th century the south chapel was built in the Gothic style with the splendid east window. Finally in 1851 the church was restored by William Butterfield, the leading architect of the Oxford Movement. Barton House is an Elizabethan Manor House, remodelled by Inigo Jones in 1636 and has a magnificent 6 ½ acre Garden, which is open to the public in the summer. As well as all the mature trees there is also a Japanese Garden, a Rose Garden, a Secret Garden, a Victorian Kitchen Garden, an Exotic Garden and a Vineyard. Outside the entrance gates to Barton House there is a small village green on which stands an elaborate domed memorial fountain built in 1874. This structure, named The Bird Memorial, is a Grade 2 Listed Building and was built as a well house and monument to R W M Bird who died at the age of 29. The Bird Family were very prominent silk merchants from Coventry who owned and lived at Barton House from 1741. The Old Parochial Church School building can be seen behind the village green on the right, and now acts as the Village Hall. Great Wolford and its close neighbour of Little Wolford are collectively known locally as The Wolfords and are set in picturesque rolling countryside. Both villages are a neat and compact collection of houses built from either mellow Cotswold stone or a combination of stone and handmade brick (sourced from the valley that separates the two villages). 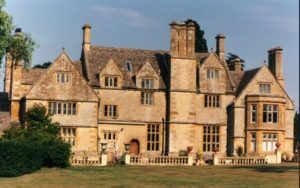 Historically the villages were owned by different estates – Lord Redesdale of Batsford Park owned Great Wolford until it was sold in 1924, whereas the Weston Estate owned Little Wolford. Fortunately the rural charm of the village with the attractive estate style cottages and houses has been well preserved since the sale. There has been a church in Great Wolford since Saxon time. The present parish Church of St. Michael and All Angels is an early Victorian Grade 2 Listed Church with panoramic churchyard views across the valley towards neighbouring Little Wolford and beyond. The churchyard is noted for its abundant wildlife. for musical performances. The organ is a fine instrument built in 1876 by Charles Martin of Oxford. Great Wolford has a public house called The Fox and Hounds, but at the time of publication was closed. Other interesting properties in Great Wolford are the bell-coted Old School House, which is opposite the church and The Teachers House further along The Green, both of which are now private dwellings.